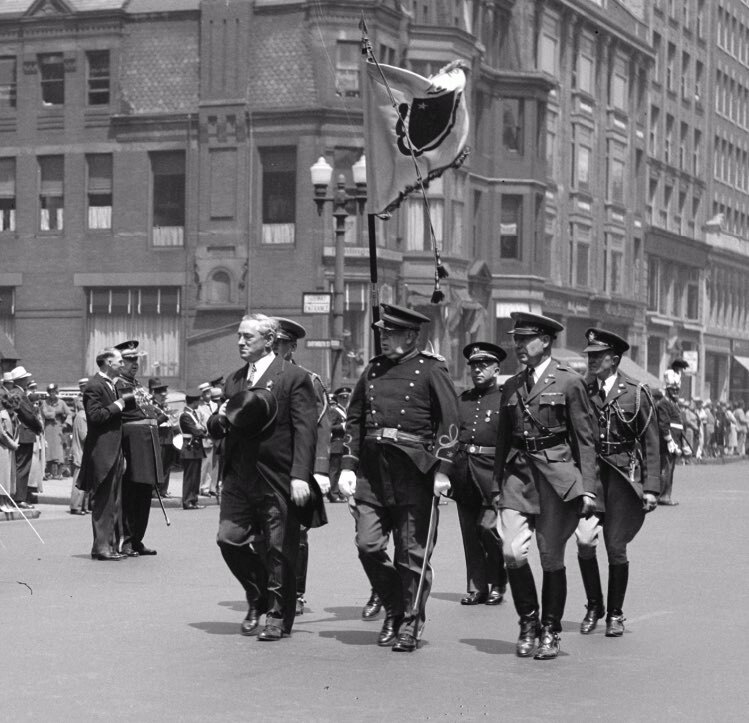 Curley marches in Ancients parade, 1936. Jamaica Plain Historical Society archives. At 8:30 a.m. on Tuesday November 15, 1956, 50 years ago this month, George Sawyer, buyer of old books at Lauriat’s bookstore on Franklin Street in Boston was commencing the sale of approximately 1,500 old and rare leather bound volumes, most of them autographed by the authors, from the personal library of former Governor James Michael Curley. Across town, at his residence at 350 Jamaicaway, the Governor had awakened to the prospect of a busy day. Today would be moving day, and he was already overseeing the packing or personal items for removal to the new residence at 9 Pond Circle, in Jamaica Plain. Possessions including oriental rugs, collections of ivory, exquisite jade, Irish silver, crystal and numerous paintings were either to be sold or transferred to the new residence. Many valuable paintings and objects of art that had been acquired over the years were catalogued and put in secure storage to be sold subsequently as circumstances dictated. The Governor was in a good mood as the movers went about their business. He granted interviews to old friends and newspaper reporters and stated that although he was sad to leave the mansion after forty-one years, it was simply too large a responsibility for him and his wife Gertrude to continue to undertake. The house with the shamrock shutters, built by Curley in 1915 during his first term as Mayor of Boston, which had served for decades as the symbol of the Irish ascendancy in Boston had been sold to the Oblates of Mary, a religious order, for $60,000. Of all the possessions he was forced to dispose of, the contents of the library were the most painful. He managed to retain approximately 400 volumes, mostly classics, that he could not part with. The library at the mansion served as the nerve center of his activities over the years; a place of retreat, study and reflection. He was never happier than when he was in his library. As the Governor oversaw the removal of the contents of the house he stepped outside to have his picture taken as he left for the last time, he had no knowledge that two years to the day, November 15, 1958, his funeral cortege would pass by this very spot on its way to his final resting place at Old Calvary Cemetery in Mattapan. Across the Jamaicaway from where he now stood, the park would be filled with mourners from the neighborhood. They longed to see “Their Jim” pass the house one last time. It was to be, and remains, the largest funeral in the history of the City of Boston. The Solemn Requiem Mass, at the Holy Cross Cathedral in the South End, was presided over by Archbishop Richard J. Cushing and said by the Governor’s son, the Reverend Francis X. Curley, S.J. There were very few people who lived in the first half of the twentieth century in the City of Boston who could deny that Jim Curley did not assist their family in some way. To this day his name is mentioned with reverence by those who are aware of what he had accomplished for the people of Boston. He particularly enjoyed being referred to as “The Mayor of the Poor.” Although he enjoyed the appellation, he did not want to be of the poor himself and went to great lengths to garner every dollar he could, by any means necessary. His quest for personal economic stability guided his every move. There was always something in it for Jim. A product of the Roxbury slums, he vowed – because of his boyhood experience – that he would do everything in his power to elevate himself and the conditions of the poor he chose to serve. Often referred to as the man with the golden voice and the brass touch, Curley was despised by some but loved by many. A child of extreme poverty, growing up in Roxbury close to the raunchy, stinking mud flats, he vowed at an early age to rise above his meager surroundings, become a learned man, achieve high political office and assist those in similar circumstances of deprivation, poverty and despair. He chose to do this by measures that those of inherited wealth would decry. He had a particular dislike for those Boston Brahmins whom he claimed possessed “an air of ancestral superiority” and delighted in antagonizing them. However corrupt Jim Curley might have been, he was certainly competent. Recognized nationally as a very effective chief executive, he would never countenance slipshod workmanship or design in his many public works projects, most of which have withstood the test of time. His last project, the building of the George Robert White Schoolboy Stadium in Franklin Park, is still as solid as the day it was dedicated in September of 1949. Growing up in Jamaica Plain in the 1940s and 1950s one was aware of the presence of James Michael Curley by what they heard at home, in school, and on the street. His handsome stature was overwhelming. It was always a treat to visit the home at 350 Jamaicaway on Halloween and receive a silver dollar from the Governor himself. When he finally moved from the mansion in 1956, I saw much more of him as he now attended mass at Saint Thomas Aquinas Church on South Street, parish lines being very strict in those days. He would attend the 11:45 a.m. Sunday morning Mass, accompanied by his wife. At 11:43 a.m., “Himself” would arrive and walk down the main aisle with Mrs. Curley to the first pew on the right, assuring that those in attendance have time to see him. Although out of office at the time for six years, he was still more widely known and admired than any office holder in the Commonwealth of Massachusetts. After Mass he would linger to talk, receive the acknowledgement of all, and then walk up Child Street to the parking lot and be driven away in his Buick Roadmaster, Massachusetts registration number 5. Jim Curley was an intense, deeply committed member of the Catholic faith and practiced it fervently. A realist who took his share of plunder in public life, his personal life was exemplary and above reproach. After the death of his first wife in 1930, he built the new Our Lady of Lourdes Church in Jamaica Plain and caused the main alter to be dedicated to her memory and the side alters were dedicated to those children who had predeceased him. By 1956 he had not only buried Mary Emelda, his first wife, but seven of his nine children. His faith had been tested repeatedly over the years and only a deeply religious individual could have survived the terrible experience he endured. In order to show his unshakeable faith several years earlier, he presented to Archbishop Richard J. Cushing a monstrance containing the Curley family jewels in memory of his first wife, Mary Emelda Curley and his daughter Mary Curley Donnelly, to be used in daily exposition at the chapel of the Joseph P. Kennedy Junior Memorial Hospital in Brighton. Although he carefully cultivated the illusion of poverty after he left office in 1950, members of the household staff, old friends and retainers would tell of plentiful food and supplies and a generous amount of necessities at all times at the mansion. There was never any shortage of resources at hand. Many people to this day believe, as Jim wanted them to, that he died broke. Although he only left $3,768 in personal property this was a man who was President of the Hibernia Savings Bank for over twenty years, never had a checking account and always dealt in cash or barter. Jim Curley was far removed from any impoverished condition. Even a cursory look at the record would indicate that Jim was very comfortable in his declining years. During Curley’s six months in Danbury Correctional facility in 1947, Temporary Mayor John B. Hynes only acted upon necessary matters that would not admit of delay. Upon Curley’s release from jail, over forty million dollars worth of contracts were awaiting Jim’s approval and signature. At one half of the customary rate of ten percent, the cut for Curley, the take would be a staggering two million dollars. In his last year in office in 1949 abatements to assessments ran to over ten million dollars or 11.6 percent of the total tax levy for the year. This practice flourished during his last term when over twenty million dollars in abatements were granted. Curley’s moneyman, Peter Allen, a graduate of Princeton University, who had been appointed by Curley to the position of Chairman of the Board of Assessors, would arrive at the mansion with pillowcases full of money from grateful petitioners. All assessing records at that time were kept in pencil. The entire process was extremely secretive. Following his defeat by John Hynes in November of 1949, Curley let it be known through his minions that the city was for sale. Following a lifelong pattern of plunder on the way out the door, two and one half million dollars in abatements were granted in November and December alone. Transfers and promotions in various city departments were expedited during this short period. Contracts for rubbish and garbage removal were granted at exorbitant prices to those willing to pay the appropriate amount to Jim. One of the main issues of the campaign of 1949 was the controversy surrounding the granting of permits for erection of outdoor amusement theatres in the city. Curley, in a campaign statement, unequivocally stated that the granting of such permits would not occur as long as he was the Mayor of Boston. After his defeat, permits were promptly granted to establish a drive-in theatre in the Neponset section of Dorchester and one on the VFW Parkway in West Roxbury. To sweeten the deal in West Roxbury, Jim’s family was allowed to operate a nursery on the grounds. The family that the permits were given to is now one of the giants in the entertainment industry of the world. In October of 1950, while gearing up for the mayoral election of 1951, the coffers were full and a mayoral run would garner at least $150,000 of which Jim, after expenses, could secrete $100,000. Although he was considered a long shot, anybody doing business with the City of Boston and knowing Jim’s vindictiveness was well advised to donate to his election effort. This pattern was repeated in the run-up to the mayoral election of 1955 and achieved the same results. The years 1950 to 1955 went gently by, and Jim was still very much in demand as a speaker at functions around the state where he was always welcomed cordially. Regarded as one of the most effective orators of his day, Curley lectured at the Staley School of the Spoken Word in Boston and in 1952 traveled to New York City to the Speech Arts Studio to record six of his most memorable addresses which he successfully sold. The record album and the printed addresses were carried by an assistant to all his appearances and were available for purchase. As an orator he had few peers and to agree to engage in debate with Jim Curley would be similar to agreeing to enter the ring against Joe Louis. In the spring of 1956, with no more hope of raising significant amounts by running for mayor, the still comfortable hoard of cash beginning to be slightly depleted and the exposure of Jim Curley becoming somewhat diminished, along came a savior by the name of Edwin O’Connor with a best selling novel entitled “The Last Hurrah.” Loosely based on the life and last campaign of Jim Curley, it received favorable review in the New York Times Book Review and was included in the May 1956 Reader’s Digest Book of the Month Club. The notoriety of this splendid work brought Jim Curley back into the spotlight for which he so eagerly yearned. O’Connor’s book, and the subsequent movie starring Spencer Tracy, put Jim back in business and the ever wily Jim, the acknowledged master of the hold-up, sued the producers of the movie and was able to squeeze $46,000 out of them for full release of all his claims. The spring of 1957 would see the newly inaugurated Governor Foster Furcolo appoint Jim Curley to a $7,500 a year sinecure at the State Labor Relations Board. The average annual income in the United States in 1957 was roughly $4,900. Shortly after this appointment, his autobiography, “I’d Do It Again,” was published and went through six printings. The notoriety produced by these two books, plus the movie; brought Jim Curley renewed popularity and many invitations to speak. He was interviewed by Edward R.Murrow on his nationwide television program “Person to Person” and proceeded, book in hand, to talk about his autobiography “I’d Do It Again.” Anybody witnessing that interview which took place in the new home at Pond Circle could tell by the elegant surroundings that Jim Curley was living in anything but impoverished circumstances. Death came to Jim Curley on November 12, 1958 and the City of Boston paused to mourn the death of this giant of a man. Over a million people visited The Hall of Flags where he was waked at the Massachusetts State House, and hundreds of thousands paused to view his funeral cortege. It was a spontaneous, genuine send-off to this remarkable man. Boston will never see another Jim Curley because times and circumstances have changed. But let us not forget that it was he who built this town in the first half of the twentieth century. For those of you reading this today, he did it for one purpose: to raise the stature and living conditions of those who came in the great waves of migration of his day. For this legacy we owe a lasting debt of gratitude. Today he would be in the forefront in assuring equality for all the newer arrivals to Boston in the past four decades. The house on the Jamaicaway is now owned by the City of Boston, through the intercession in 1988 of then Mayor Raymond L. Flynn and then City Councilor Thomas M. Menino who mounted a very effective “Shutter the Thought” campaign to thwart any effort to turn the ownership of the mansion and grounds to private ownership. It is presently being used sparingly for receptions, community meetings and private parties. It is not being utilized effectively and has been the subject of occasional acts of vandalism. On the fiftieth anniversary of Jim Curley’s departure from the mansion it would be appropriate that the beloved building be better utilized than it is at present. I propose that the mansion, the symbol of the immigrant experience in Boston, become the residence of the next duly elected Mayor of the City of Boston. The Mayor of Boston has the most difficult position of any elected official in New England. I contend that it would be a fitting tribute to the memory of James Michael Curley to have his former home become the official residence of the Mayor of Boston and that it would be a small “Thank you” to the occupant for assuming the burdens of the position of Boston’s Chief Executive, a position that requires due diligence and a hard shell to repel the slings and arrows of critics who have no idea of the problems confronted by a mayor of such a huge and complex city. Reprinted with permission from the November 2006 issue of the Jamaica Plain Bulletin. Copyright © 2006, The Bulletin Newspapers, Inc.